You can take advantage of the Google Analytics service to generate detailed statistics about traffic to your Developer Services portal. To activate the service, you need to enable Google Analytics in the developer portal and then add the Google Analytics web-property ID to the portal's system configuration. Select the Modules entry in the Drupal administration menu. Select the Statistics section to expand it. Check the Google Analytics checkbox. Sign up for the Google Analytics service if you haven't already done so. 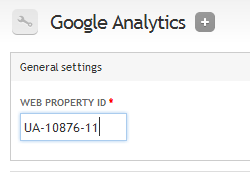 In response, you'll receive Google Analytics tracking code and a web-property ID. The web-property ID takes the form UA-XXXXX-YY, for example, UA-10876-11. Select Configuration > System > Google Analytics in the Drupal administration menu. This opens the Google Analytics page. Add the web-property ID after "UA-" in the Web Property ID field.